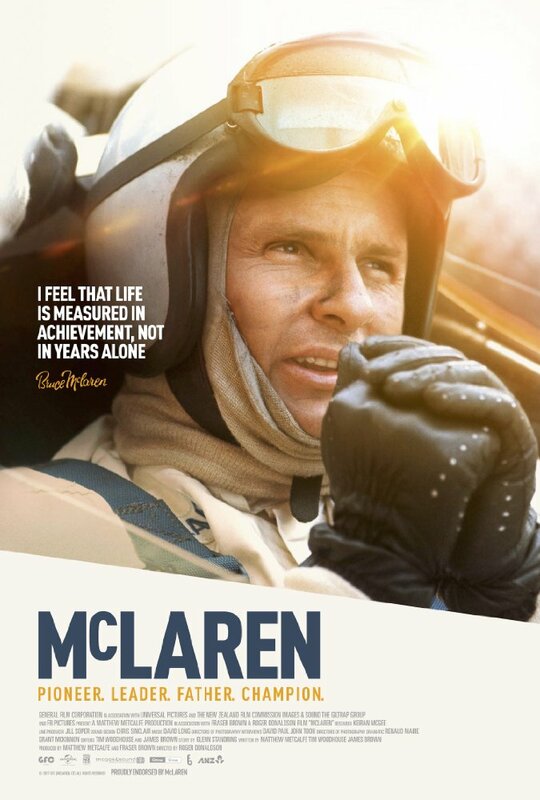 The small independent Connaught Theatre in Worthing announced a one night only viewing of the documentary McLaren. For 90 minutes a small audience sat transfixed as the incredible 18-year racing career of New Zealander McLaren unfolded via in-period footage; the same day this film would be first broadcast in Indianapolis just prior to the weekends 500 race. Timing is everything in life and a more suitable occasion to launch this picture couldn’t be bettered, with Fernando Alonso 2017 McLaren-Honda parke d on the ‘Brickyards’ grid. New Zealander Bruce McLaren’s racing career began with his home built Austin Ulster at just 14 years old; his engineering skills would complement his incredible driving talent and impress all, throughout his life. Undeterred by the physical handicap of having one leg shorter than the other due to Perthes disease destroying his left hip joint, for Bruce there were never enough hours in the day and there was always a race to prepare for. This film comes via the brilliance of director Roger Donaldson (Thirteen Days, The World’s Fastest Indian) and enjoys accounts from Emerson Fittipaldi, Alastair Caldwell, Chris Amon, Howden Ganley, Mario Andretti, Dan Gurney, Lothar Motshchenbacher and Sir Jackie Stewart. More poignant is the thoughts of his family, friends and the guys that worked alongside Bruce on a daily basis. All their contributions run alongside reworked archive film beginning with McLaren’s early life ‘down-under’ winning road racers across New Zealand before coming to England. It was at his home Grand Prix McLaren caught the attention of Jack Brabham and with the backing of the New Zealand Grand Prix organisation he became the first to enjoy the ‘Driver to Europe’ scheme; with John Cooper Cars and their F2 programme for 1958. This docu-film includes some remarkable footage from this era and goes on to Bruce’s F1 victories including a very dramatic Monaco GP in 1962 and his Le Mans triumph in 1966. The McLaren works, staffed mainly by fellow Kiwi’s was located in Feltham near Heathrow Airport which suited young Bruce as they would build Can-Am cars that he could pilot and dominate across the pond in the late 60s. It was testing such a machine that saw the final chapter in Bruce McLarens illustrious career and life end in 1970, at just 32. On limited release at independent cinemas across the country before appearing on Blue Ray and DVD, McLaren – the Film is a celebration of one character who succeeded in a motorsport era that for many will never be better. A remarkable insight into the life of an engineering pioneer, daring race driver and one Kiwi that is universally remembered back home as a ‘great bloke’. If you are a McLaren fan and fancy getting behind the wheel, check out supercarhire.co.uk. Now you can experience life as a supercar owner, even if it is just for a short period of time. McLaren (12a) Reviewed – Compulsory viewing for all petrol heads.